Howard Schatz’s Athlete series is an interesting exploration of the different forms the human body can take. Schatz has chosen elite athletes from a range of sporting disciplines as the basis for his photographic study. These athletes represent the ideal physique required to compete at the highest level of their chosen sport. Their bodies reflect how both genetics and years of specific training come together to produce the world’s best sportspeople. 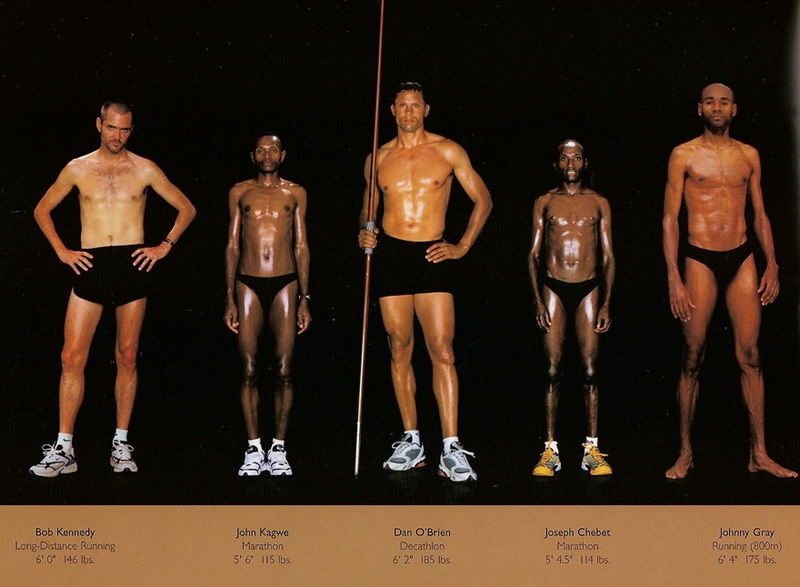 Below is a selection of images from Howard Schatz’s book, Athlete. They show us that strength and flexibility come in many shapes and sizes, both qualities being essential for the body to function effectively of course. Pilates done regularly is a highly effective way of improving the strength and flexibility of our bodies. Feet have a key role to play in achieving balance in the body. With twenty-six bones, thirty-three joints and more than a hundred muscles, ligaments and tendons in each one, the foot is a marvel of engineering and yet it is often overlooked by anatomists and medical students, indeed by all of us. When our feet go wrong then we pay attention to them. Only when they stop working properly do we appreciate what they do to keep us upright and move us around all day. According to anthropologists, the development of the arches of the feet allowed us to step into our humanity more than two million years ago. It is the evolution of this part of our anatomy more than any other that enabled man to walk upright, freeing up our hands and our brains to focus on other more complex tasks. Feet not only provide insight into how we developed as humans, they tell the story of our overall physiological health. When the foot hits the ground, everything is affected. Conversely, an imbalance in the pelvis places strain on the knees and ankles, which can be seen in our feet, even when they are not weight bearing. When we run approximately half the energy used in each step is stored in the elasticity of our Achilles tendons and released via the arches of the feet. The arches, two along the length of the foot and one across its width, also bear our weight. They are necessary for strength, just like the spans of a bridge. Without the arches, the feet can’t support the weight of our bodies. The feet need to be flexible in order to reduce the impact of postural imbalances and to improve stability when we move around. As we age the foot becomes less flexible increasing our susceptibility to ankle sprains, knee and hip pain, and to falls due to poor balance. Similarly, repetitive movements such as walking and running, inappropriate footwear and a sedentary lifestyle, can all contribute to a loss of flexibility in the feet. Tension in the feet can affect the legs and hips. This is because the muscles of the calves run all the way down into the feet. These in turn connect via fascia to the muscles of the upper leg and hip. To address this tension and inflexibility, Melissa now incorporates foot exercises into the Pilates classes she runs at The Wellbeing Studio and the Complete Health Clinic in Clevedon. The exercises, using special textured balls are easy to do and feel good. Doing them at the start of the Pilates class helps maintain proper foot alignment for the rest of the session, which improves the recruitment of the muscles in the hips, pelvic floor, and abdominal area. Balance is something we strive for in our professional and personal lives. When we practise Pilates we’re aiming to achieve a balance in the way our body works, nothing overworking, nothing underworking, everything in the body taking its fair share of the load. Lara Jacob’s performance in Cirque de Soleil’s Amaluna can teach us a lot about harmony and stability. The Balance Goddess act creates a world in equilibrium with a mobile made of thirteen palm leaf ribs. The soundtrack to the routine is beautifully spare, largely using the sound of Jacob’s breathing. Her movements are slow, deliberate and almost meditative as she concentrates all her attention on building the mobile. The Balance Goddess act reminds us of the fragile nature of harmony. Lara Jacobs was born into an artistic family. 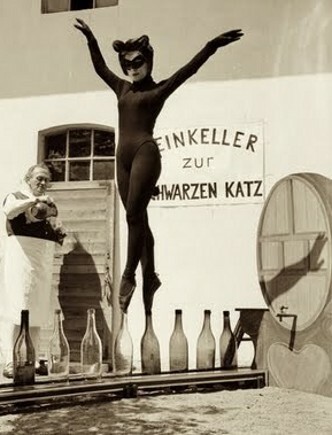 In fact it was her father who created the Balance Goddess act and he continues to perform it himself all over the world. At the age of six Lara Jacob’s began performing and touring as a trapeze artist with her parents’ theatre, Rigolo Nouveau Cirque. When she was 16, Lara went to New York City and enrolled at the prestigious Alvin Ailey Dance Centre. She later travelled to Istanbul where she trained in dervish dance, a traditional Islamic dance also known as Sufi whirling, which consists of spinning the body in rapid, repetitive circles. With this new talent, she began performing a solo fire burning skirt routine for Rigolo Nouveau Cirque, for numerous galas worldwide, as well as the famous German circus, Circus Roncalli. To meet the increasing demand for our classes, Embody Pilates now runs two group sessions on a Tuesday evening, from 18.15 to 19.15 and then straight afterwards from 19.15 to 20.15. Like all the Pilates classes on our weekly schedule, they are suitable for all ages, sizes, abilities and fitness levels, and take place at The Wellbeing Studio in the heart of Clevedon. Click the following links to find out where the studio is and to have a look inside the studio. The cost of a block of six group Pilates sessions is £50. The classes can then be taken as and when you’re available. No booking required. For those who’d prefer to pay for each class individually, the cost is £10. Thank you to all our clients for supporting Embody Pilates by coming regularly to class and for recommending us to family and friends. This is so valuable to us in attracting new people. 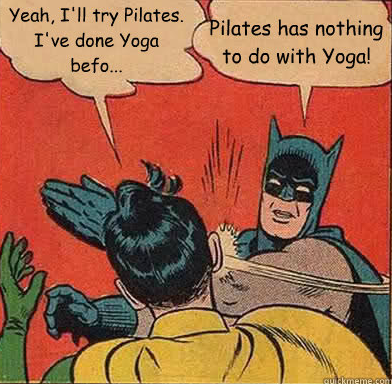 Batman is right, Pilates and yoga are two very distinct disciplines. Piloga though is another matter, a unique fusion class which explores the similarities and differences between the two. Using the Pilates approach to breathing and the pelvic floor engagement at the heart of Joseph Pilates’ method (Note – if you’re attending a Pilates class and the teacher doesn’t use either of these things then you’re not really doing Pilates and are missing out on the main benefits), Piloga brings together the best of both disciplines to create a full-body workout focussed on core stability and controlled flowing movements. The aim of Piloga is to strengthen and improve the flexibility of the body by taking it through a healthy range of bending, stretching and turning. The age of those attending is diverse, from mid-twenties to over sixty. Most people are beginner or intermediate level and attend regularly because they find the class helps them avoid feeling achy and stiff, or helps them manage a condition they suffer from like sciatica or arthritis. Others come as a way of recovering from injury, or to improve their performance in another sporting activity, e.g. running or cycling. The classes are open to all, free to members of Strode Leisure Centre, or £7.40 per 90-minute session for non-members.